Several years ago I received a large number of mostly used Australian (and other countries) commemorative stamps from the American Philatelic Society (APS) that are to be given away free of charge for "recreational & educational" purposes. To me that means if you are a beginning or youth collector, you qualify (or if you happen to collect worldwide stamps)! ----> November 1, 2018 UPDATE: all previous stamps sets #1 - #12 are now gone! There is now a new set #13: a selection of 47 used Worldwide stamps ! 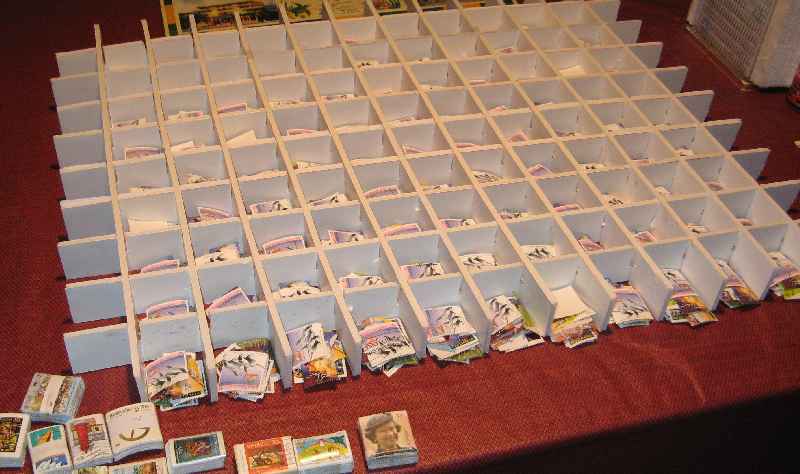 (see picture below); the stamps are seen in the top 3 rows in the picture below (as well as in the sorted bins). See instructions below for requesting the free stamps! Above is a photo of the actual Worldwide stamps that are in the set #13. Stamps are from various countries, including Canada, New Zealand, Australia, and others. All stamps are postally used, and the ones you will receive will generally have fairly light to medium postmarks and cancellations. Each of these stamps came in little bundles of approx. 100 alike stamps, and I created 75 sets (after discarding damaged and heavily canceled stamps). (The picture above shows the large box of stamps that I received from the APS in April 2012, after I had it partially sorted it out... Not all stamps are from Australia. The left black box contains common worldwide definitives, the 2nd and 3rd black boxes are Australian, the right black box is Great Britain Machin stamps. The big Priority Mail box contains loose stamps from around the world, 99% were from Australia. Each of those little black boxes contain about 7,000 stamps...). As I get packets of stamps ready, I will post notices on the various stamp collecting groups at Yahoo! The key thing to remember is that these stamps are free to anyone, but anyone that is not local to me will have to reimburse me for the postage to mail these (sorry, but I'm not going to pay postage for everyone on the planet... my budget doesn't allow for it). --> The information below may seem lengthy, but everything you need to know is there, so there's no need to e-mail me with questions! PayPal (https://www.paypal.com) payment for US $1.70 sent to info@stvincentstamps.com . The reason I'm asking for $1.70 is that PayPal will charge me fees, resulting in the $1.15 that I need for postage and an envelope to mail you the stamps. Please note that PayPal may give you a choice in sending funds in various currencies; due to the high conversion rates, I can only accept PayPal payments in US Dollars (if you send funds in other currencies, I will refuse or return the payment). Be sure to let me know your return address! In the off-chance that I am completely out of the set that you are requesting, I will send the next set that I have available. Please write legibly! If I can't read your writing, neither can the US Postal Service mail processing equipment! The stamps in each set are identical; so please do not send in for additional sets of the same number, as you would simply get duplicate stamps and deprive someone else of getting a set. Do NOT send any stamps in trade, I do not want any. Regarding any stamps that originated from the APS: I am not allowed to accept any trades or payment for these stamps as part of my signed agreement with the APS that these stamps are only to be given away (although they stated that asking for return postage is only fair). The stamps that are part of the give-away are fairly common with minimal catalog values, meaning 25¢, and are best suited for youth or beginning collectors; they are a great way to add some nice stamps to your collection. Do not use or send me previously used or uncancelled US stamps on your stamped return envelopes. Why? Because it is a federal criminal offense here in the USA to reuse previously used but uncancelled stamps, and since it will appear to the US Postal Service that I have put these stamps on the envelope, I could potentially be subject to criminal penalties. So, if you send me an envelope with previously used or uncancelled stamps on them, your request for free stamps will be ignored. Please use commemorative stamps on your letters to me. I am a collector as well. Do not use common or definitive stamps. Since I am going through a lot of effort to give these away, the least you can do is use a commemorative stamp on your letter to me! Remember that sending cash or banknotes through the mail is at your own risk. I simply offer this as a convenient alternative to using US stamps or sending an IRC. You can contact me via e-mail if you'd like, but only if there are some extenuating circumstances. There's no need to reserve these stamps, I'll have enough to go around for quite a while. Once the supply is getting close to be depleted, I will update this this page (or delete it if I am totally out of stamps). Please keep in mind that some foreign mail can take quite a while to reach me. Recently it took 3 weeks for an envelope mailed from Singapore to reach me! Therefore it could take anywhere from 2 to 6 weeks for you to receive your stamps from the date that you originally mailed your request. Only one request for each set per person / household. The stamps in each packet are alike, don't ask for a 2nd set; one set per address please. I am not responsible for items lost / stolen in the mails; this does happen unfortunately from time to time. The stamps are sent via regular 1st class or airmail the day after I receive your request. --> Requests without payment of return postage (either as SASE, IRC, PayPal or cash) will NOT be honored ! Unfortunately I can not afford the postage to mail free stamps to hundreds of people around the world. March 23, 2008 - Here's set#2 of 55 different Australian stamps from an earlier set, awaiting collectors, it was a bit easier to make these 100 sets since I made a box to sort them faster.. 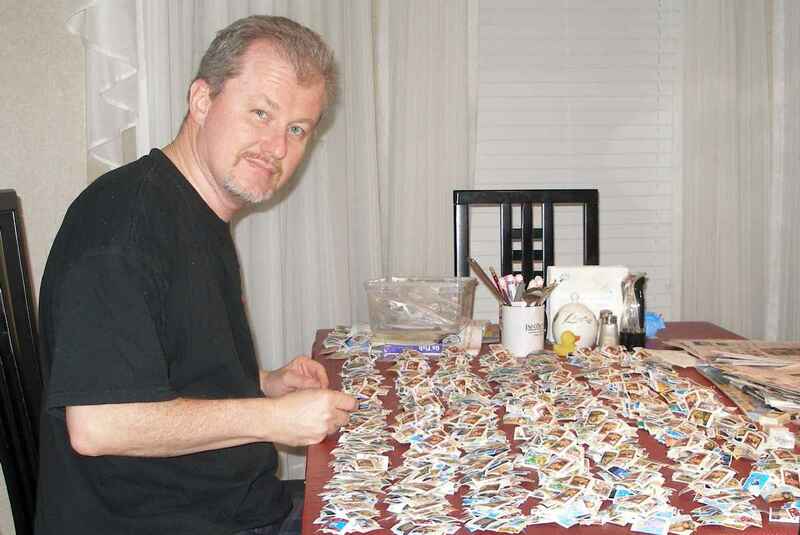 In total, I have now given away over 1,000 sets of Australian stamps! 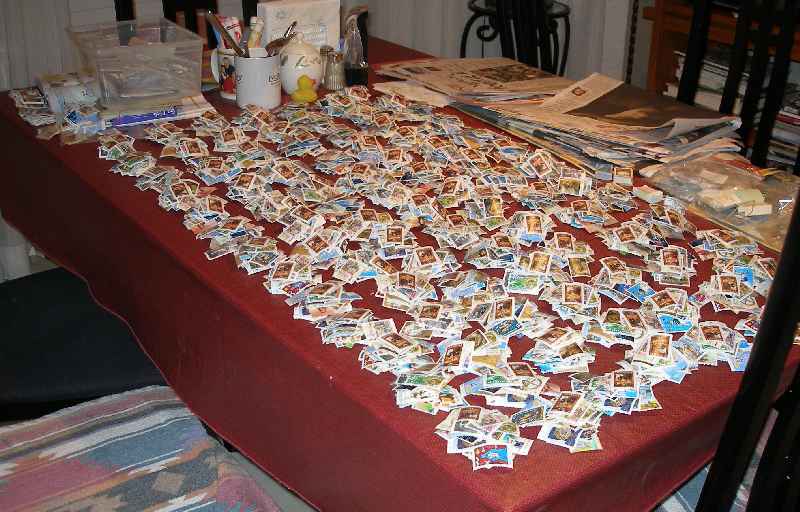 This is over 55,000 individual stamps! The recent Great Britain Machin sets are now gone and for the current set I'm doing general worldwide (although mostly Canada, Australia & New Zealand). I do also have duplicate USA & Foreign stamps from my own collection available for only 9¢ per stamp, please click here to order.